Women's March Organizer Linda Sarsour Supports Sharia Law-MostlyTruth! - Truth or Fiction? Women's March Organizer Linda Sarsour Supports Sharia Law-MostlyTruth! Women’s March Organizer Linda Sarsour Supports Sharia Law-MostlyTruth! 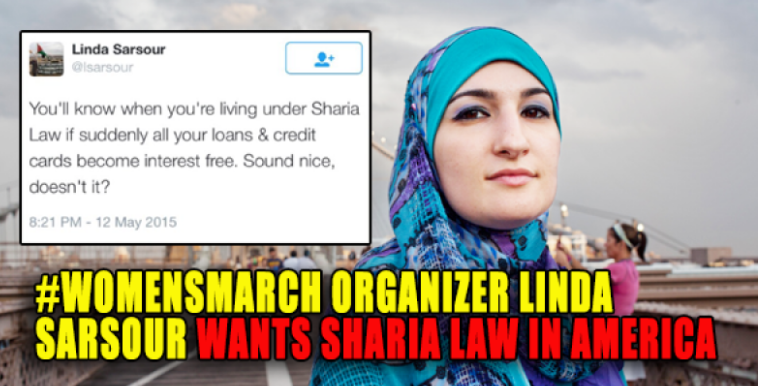 Women’s March co-organizer Linda Sarsour has supported sharia law in America. Linda Sarsour has spoken in support of some aspects of sharia law, and Sarsour has opposed state laws banning aspects of sharia law in the past. Linda Sarsour, 35-year-old mother of three, has become a well known community organizer and advocate for immigration reform and social justice related to minority communities. In addition to serving as the national Advocacy Director for the National Network for Arab American Communities (NNAC) and the director of the Arab American Association of New York, Sarsour has been an outspoken feminist who has pushed back against accusations that her feminist views contradict her Islamic beliefs. After her role in co-organizing the Women’s March on Washington, Linda Sarsour came under fire from right-wing websites and commentators for public comments that she’s made in the past about sharia law. The Gateway Pundit was among the most vocal critics of Sarsour for appearing to support both sharia law and feminism through her work on the Women’s March. It should be noted, however, that Linda Sarsour has been a longtime target of critics of Islam — including members of Congress back in 2012— so her views had been documented well before her role in organizing the Women’s March. In the wake of her co-organizing the Women’s March, Linda Sarsour’s critics have gathered examples of her defending or advocating for different aspects of sharia law. There’s no way for us to definitively find and archive all these examples, but we’ll look at a few of them here. @NYCCouncilWatch A ban on sharia law would ban the application or implementation of Islamic law (sharia) in courts in any jurisdiction. That tweet may have been referencing challenges that sharia law bans have presented when it comes to divorces, civil matters and estate planning. In the 2012 case Soleimani v. Soleimani, for example, a jury elected not to consider a contract known as a “mahr agreement” that was supposed to entitle a Muslim woman in the case to $677,000 in the event of death or divorce from her husband because of a Kansas law prohibiting the application of foreign law in court, an effective prohibition on sharia law. That’s just one well-known example of legal issues that can arise from sharia law prohibitions. Linda Sarsour refers to Islam’s prohibition on fixed interest. This is based on the belief that “money is only a medium of exchange, a way of defining the value of a thing; it has no value itself, and therefore should not be allowed to give rise to more money, via fixed interest payments,” the Islamic Institute of Banking and Insurance reports. I mean, if we want to uphold our values and we want to show the rest of the world how wonderful we are, we need to start here at home. While we`re talking about partnering with Muslim communities and you are a partner, you`re part of the fabric of our society, our government operates massive surveillance program, unwarranted surveillance in Muslim communities, chilling free speech, making people feel afraid. I mean, a lot of Muslims have come to the United States to get away from regimes where they feel like their freedom of speech is infringed on, where they – some people don`t have freedom of religion. We come to the U.S. Twenty-two states with anti-Sharia bills trying to ban us from practicing our faith, Mosque oppositions. We`re fighting zoning boards across the country. Our kids are hearing this rhetoric. We have people, mosques being vandalized, kids being executed, Islamophobia. Leaders on national television saying that, you know, holy wars and these people want to take over America. I mean, it`s just – it doesn’t`t for me reflect what we do stand for as a country. And these very – the minority in our country who are the loudest voices are reflecting what we are. And that`s not what we are as a country. I`m an American and I`m a Muslim. Should I cut myself in half? What side am I on? I`m born in Brooklyn. I can`t take that away and no one can take that away from me. I can`t be deported anywhere. So, it`s just a really hard conversation to have with young people, especially young Muslims who don`t know what side they`re supposed to be on. I`m on the American side. I`m on the right side. I`m on the side of justice. That`s the only side I`m on. Memes demonstrating Linda Sarsour’s support of sharia law have been widely circulated in the wake of the Women’s March. CIA Investigating Madonna “Blow Up the White House” Comment-Truth! & Fiction! Sniper Jeremy Elmore Saves Family of Six in Texas-Fiction! Does a Protester’s Sign Say ‘We Will Defeat America Using the Weakness of Liberal Leaders’?